We are designing and building the first commercial space telescope for astronomy and Earth observation. This satellite will generate significant revenue as soon as it is launched, addressing both the astronomical and Earth observation markets. We plan to build and launch many more satellites for these markets as well as other markets. 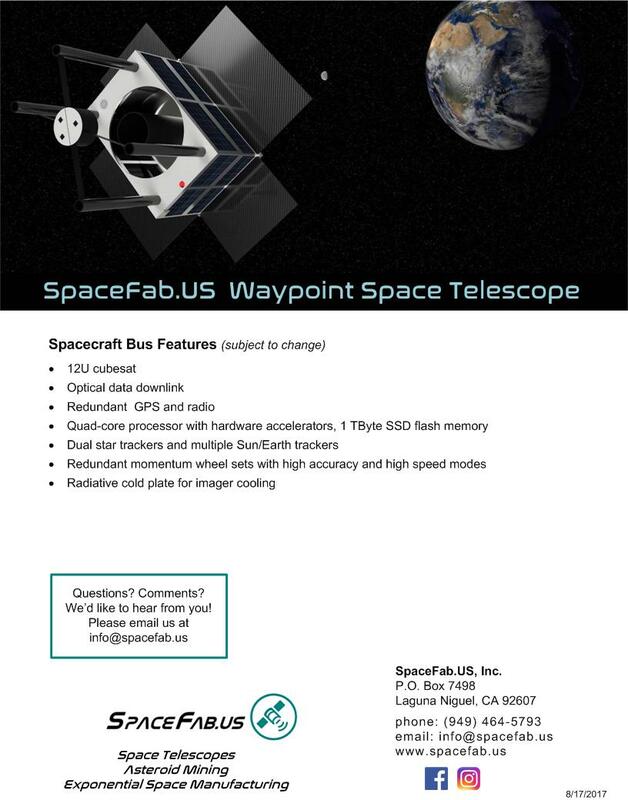 1 We have designed an advanced space telescope system that is immediately commercially viable and can be the first in a constellation of space telescopes for astronomy and high-resolution Earth observation. 2 We have patent pending technology for an ion engine accelerator that multiplies ion engine thrust and efficiency. 3 We’re working with corporate partners to design and build critical optical and mechanical components. We also have an agreement with a corporate partner to provide the launch of our first space telescope satellite in 2019. 4 We have established a relationship with a major university partner for a funding program which should result in enough customers to reach full telescope time capacity of our first satellite. 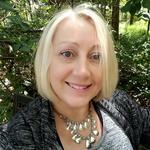 When I first understood SpaceFab's business plan and vision, I was very excited. 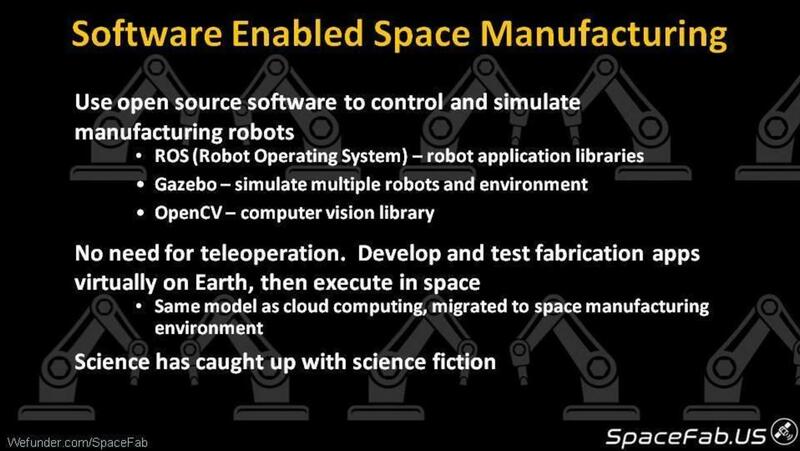 SpaceFab has a grand long term vision to accelerate construction in space by way of exponential manufacturing. Randy and Sean have a step by step plan to develop the necessary technologies. The space telescope will validate an integral part of the long term business plan and demonstrate its financial viability. I was so impressed that I became an early investor to support the launch of their first satellite. 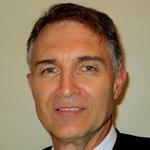 Co-founder and Board Member of Fibersat, a satellite operator. I started Houghton & Company and Houghton Capital Corporation after being with Morgan Guaranty Trust Company (now Morgan Chase Bank) and White Weld & Company. I have had my successes and witnessed failures during my long career, both as a capital raiser and as CEO of companies, including Cotton Petroleoum Corporation, Hadson Corporation, Casella Waste Systems and Hadson Energy Resources Corporation. 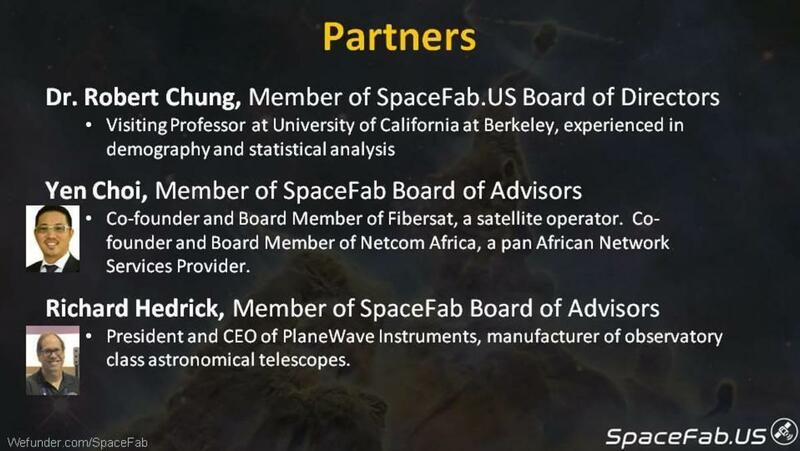 I have invested in SpaceFab.US because of the track record of the management team and the outlined business plan, and I believe the future will be in space and space technology. Lastly, because I believe an investment at this time in SpaceFab.US will multiply my investment many times over in the next two to four years. Age 73. Retired telecom engineer, 30 years IBM, 16 years Nortel. 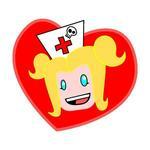 I'm a registered nurse by profession. 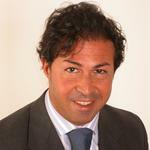 An Italian financial analyst, economist, cryptocurrency expert and Ico adviser. We are designing and building the first commercial space telescope. This satellite will generate significant revenue as soon as it is launched, addressing both the astronomical and Earth observation markets. We plan to build and launch many more satellites for these markets as well as other markets. 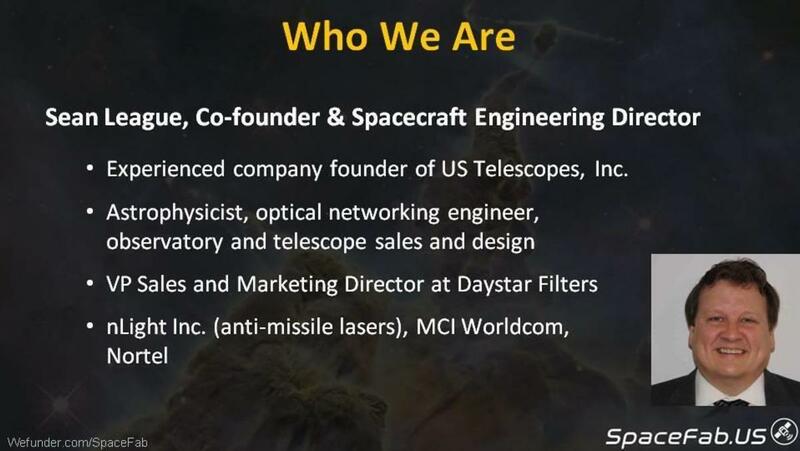 We want to be the largest provider of on-demand space telescope services, so that everyone can afford access to powerful multi-purpose space telescopes for personal, educational, and commercial use. 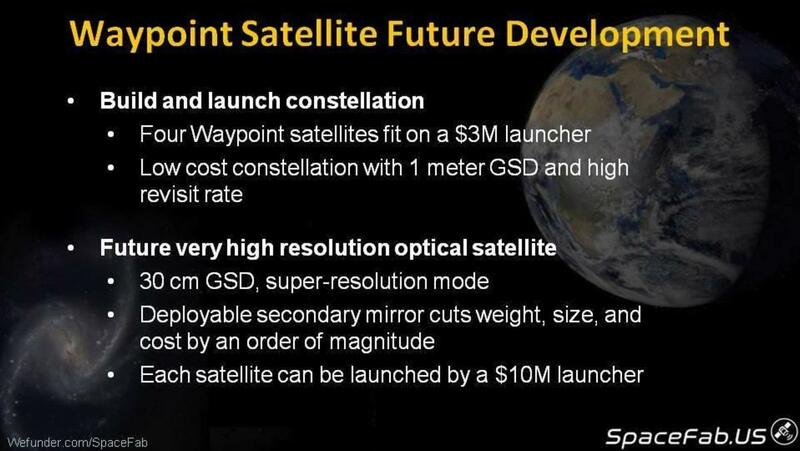 The Waypoint space telescope satellite is an advanced space telescope that will be commercially viable even from the first satellite launched into orbit. We have corporate partners working with us to design and build critical optical and mechanical components, and have an agreement with a corporate partner to provide the launch of our first space telescope satellite in 2019. We have established a relationship with a major university partner for a funding program which should result in enough customers to reach full telescope time capacity of our first satellite. We will leverage our space telescope technologies to extend into asteroid mining and exponential space manufacturing businesses. Pushing the frontier has always led to prosperity and new innovations. Our asteroid mining plan is much different from other asteroid mining companies who plan to mine water. Rather than water, we are focused on mining metal. 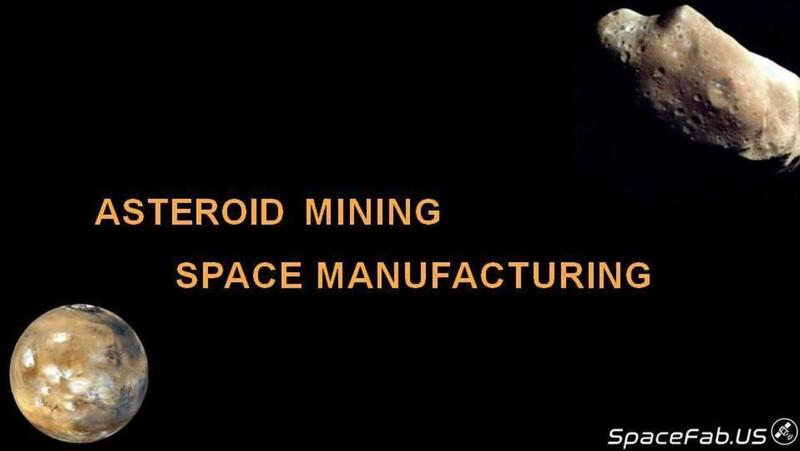 An entire manufacturing industry, leading up to Exponential Space Manufacturing, can be constructed in space using asteroid metal. The first mission in our exponential space manufacturing plan is to send a satellite to a metal asteroid, mine and refine metal at the asteroid, and return material back to Earth. We believe that the returned material could be valuable enough to pay for the cost of the mission. Our exponential space manufacturing business line will be built on the foundation of the technology we use for our space telescope satellites. We will be developing the technology to collect, process, and refine the asteroid metal. In a future mission, we will send a satellite with machine tools such as a metal 3D printer, a CNC (computer numerically controlled) machine, and an electron beam welder to make parts that can be used to make more machine tools. 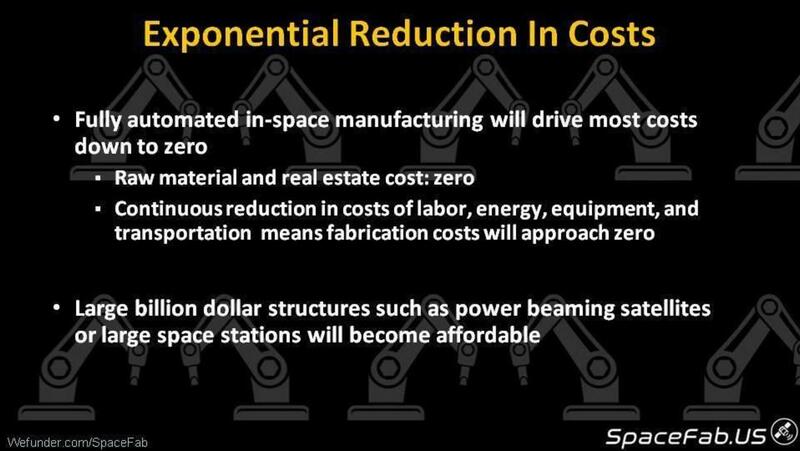 Exponential space manufacturing will make it less expensive to manufacture in space than to manufacture on the Earth, revolutionizing how we build and what we build for use in space. The closest known metal asteroid requires about double the energy needed to go to the nearest non-metallic asteroid, so we plan to use our super high efficiency ion engine accelerator for propelling our satellite. 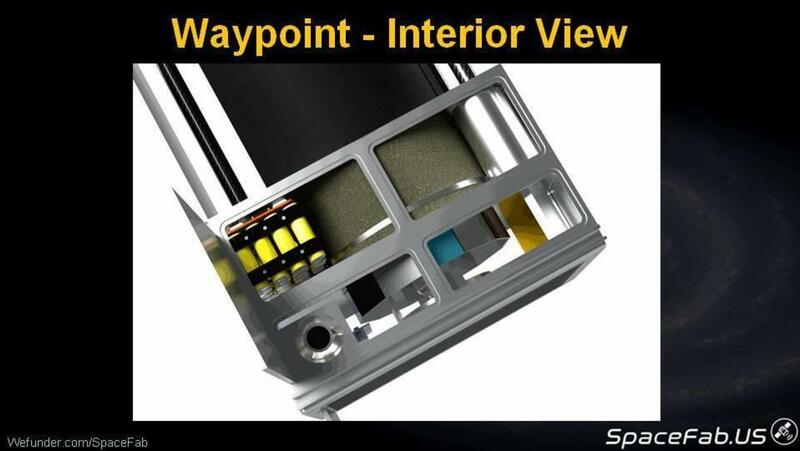 We will also be filing patents on the extendable secondary mirror for our space telescopes. 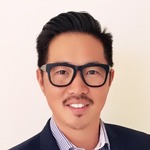 The CEO and a co-founder of SpaceFab.US is Randy Chung. 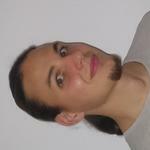 He graduated from University of California at Berkeley with a bachelor's degree in EECS (electrical engineering and computer science). His first job was at Hughes Aircraft's Space and Communications Group, working on Spacecraft Telemetry and Control. 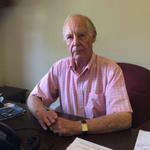 He then worked on digital signal processor integrated circuits at Hughes' Radar Systems Group. He continued working on integrated circuits at Western Digital, where, as a solo design engineer, developed the world's first single chip hard disk controller. This chip was designed into the IBM PC-AT, and Western Digital quickly grew to a billion dollar company based on this very successful product. 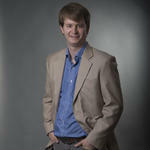 Our spacecraft engineering director and also a co-founder of SpaceFab.US, is Sean League. He is an astrophysicist, an optical networking engineer, and is experienced in observatory and telescope sales and design. 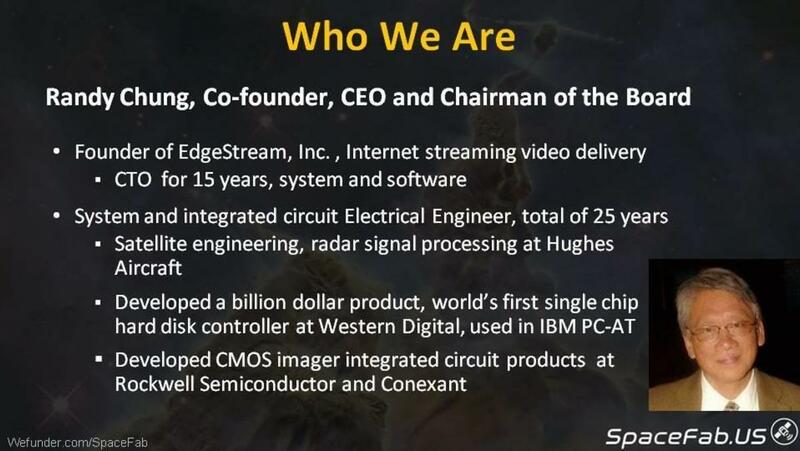 He has worked at nLight on anti-missle laser systems, and at MCI Worldcom and Nortel on optical networking. 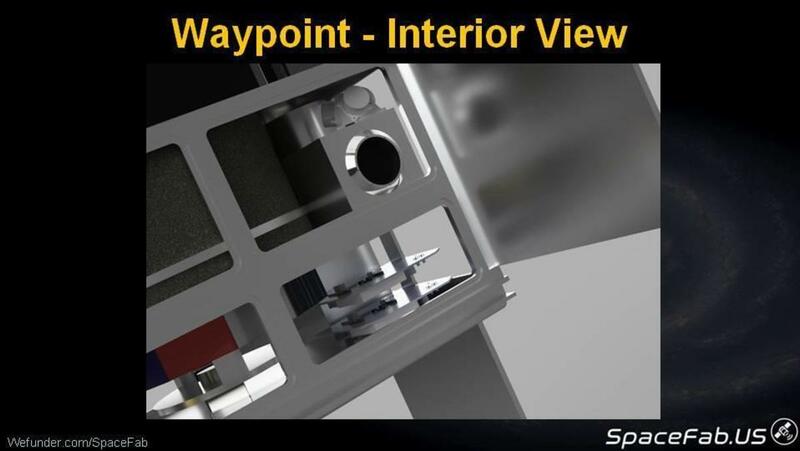 We are making great progress in identifying our target market, talking to potential customers, working with corporate and university partners, and designing our Waypoint space telescope. We've partnered with Fibersat, which will be launching a large communication satellite, and with Planewave, a top builder of observatory grade telescopes. My first job after graduating from college was working on a communications satellite, but I spent most of my career designing computer chips. Throughout my career, I've seen the changes in the electronics and semiconductor industries, starting with the advent of six transistor radios from Sony, on to computer processor chips from Intel, and now smartphones from Apple. The innovation has been amazing. Transistors started out costing five dollars each, and now you can buy an Arduino computer board with 5 billion transistors for the same five dollars. The exponential growth in processing power along with the exponential reduction in electronics cost has revolutionized our lives. In space technology, we are at a point similar to that of the six transistor radio. We've come a long way, yet we can go much farther, much faster. Let's talk about building things for space. 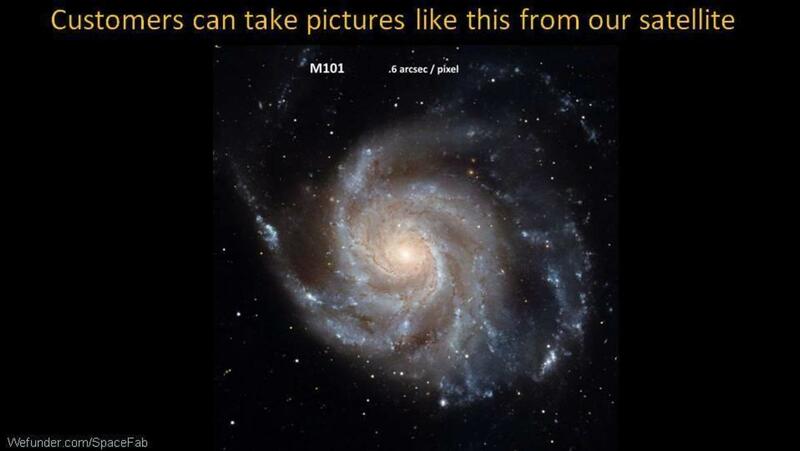 The industry currently doesn't manufacture anything in space. Instead, we manufacture on the ground and then launch into space. That greatly limits what we can build, because everything has to fit on top of a rocket. When we look at the International Space Station, it's a Tetris puzzle of rocket pieces. Once we are able to manufacture in space, we can start building structures as large or larger than the International Space Station. This opens the realm to construction projects such as power satellites and habitats for astronauts. 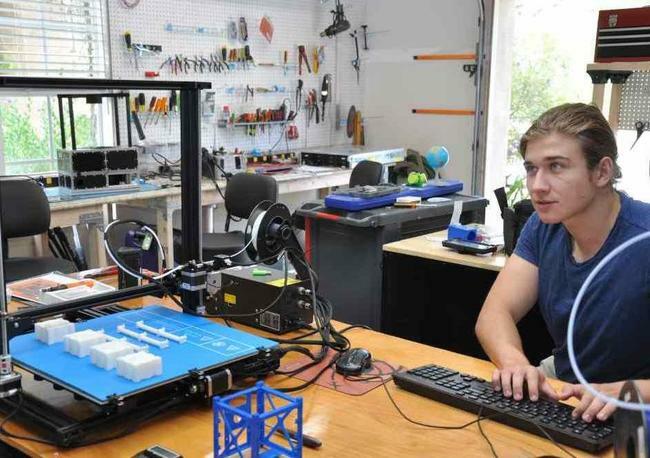 At Spacefab.US, our long term plan is to build tools which can make bigger tools and progressively build machinery for factories to make finished goods useful in space. Our asteroid mining and manufacturing approach is to focus on metal asteroids, because metal is necessary to build an industrial base in space. The raw metal at a metal asteroid is essentially free, and can be used with a minimum amount of refining to make all kinds of manufacturing tooling. As space manufacturing capacity grows exponentially, the cost of space manufacturing will go down exponentially, just as it has happened with the semiconductor industry. 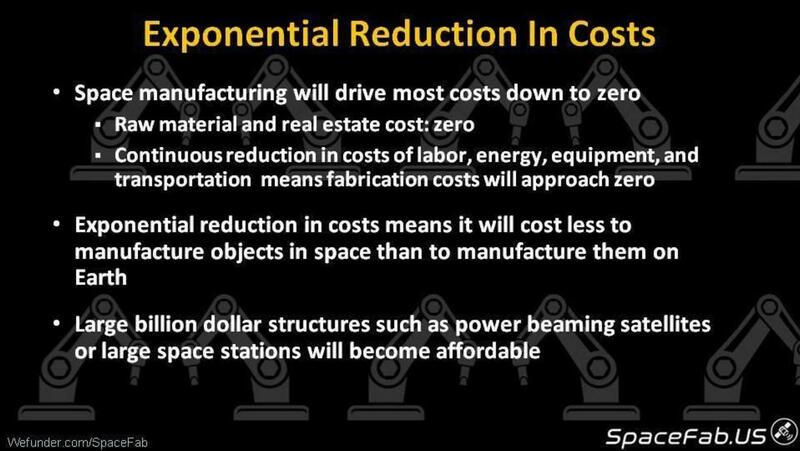 The exponential cost reduction over time means that it will be less expensive to manufacture most things in space than to manufacture them on Earth. The first step in implementing our big audacious goal is with a space telescope satellite business, because all the technologies we use for space telescopes can also be used for our space manufacturing satellites. This allows us to develop and refine our technology while bringing in revenue. 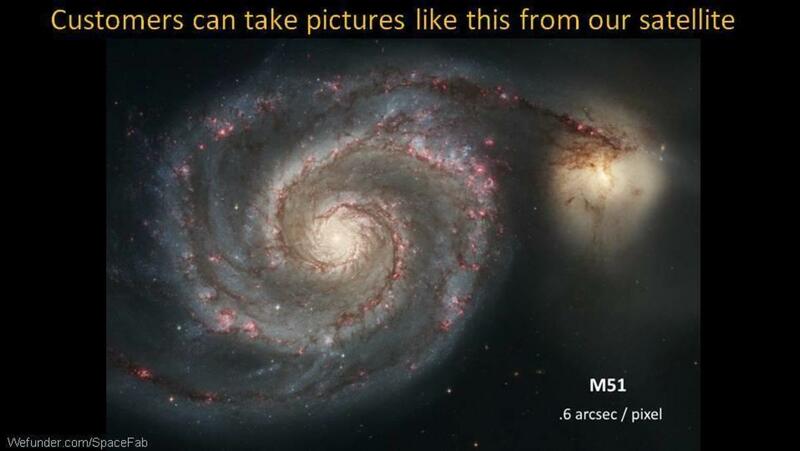 All investors will receive time on our space telescope satellite to take beautiful pictures of the Earth or stars and galaxies. This time can be for yourself or the time can be donated to your favorite school. 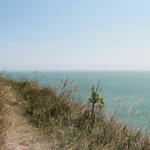 When we are excited by a scalable idea, we often say "the sky's the limit". 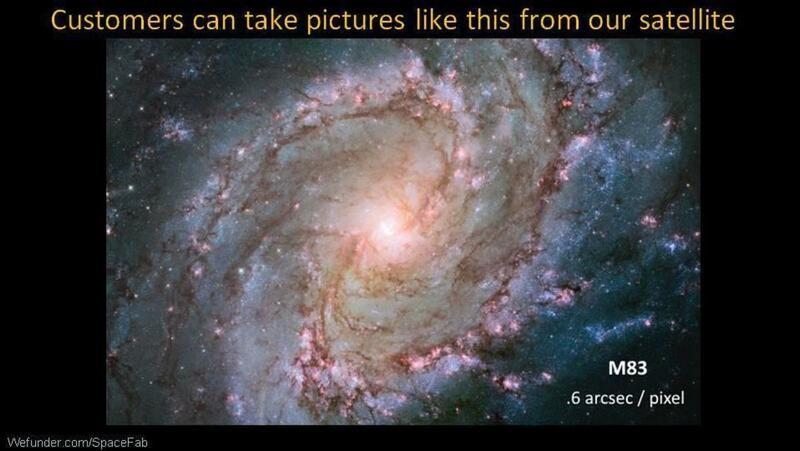 We have taken this to the next level and live by "the sky is unlimited!" We are calling on space enthusiasts around the world to invest in the future of SpaceFab.US, to invest in an exciting future for all mankind. 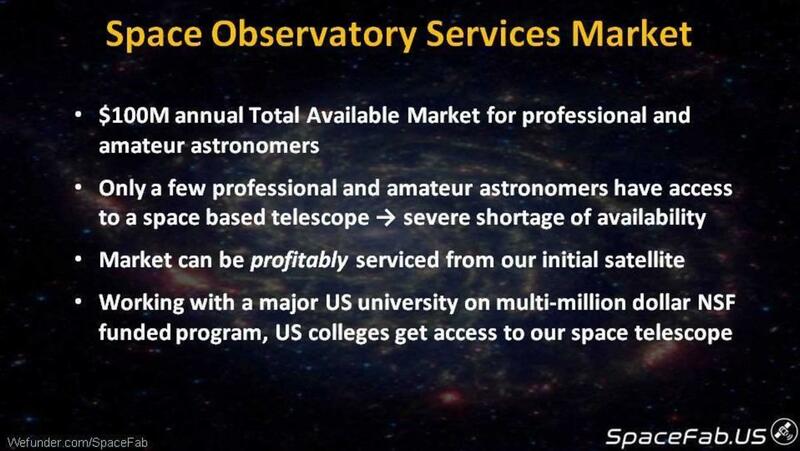 We want to be the largest provider of on-demand space telescope services so that everyone can afford access to powerful multi-purpose space telescopes for personal, educational, and commercial use. 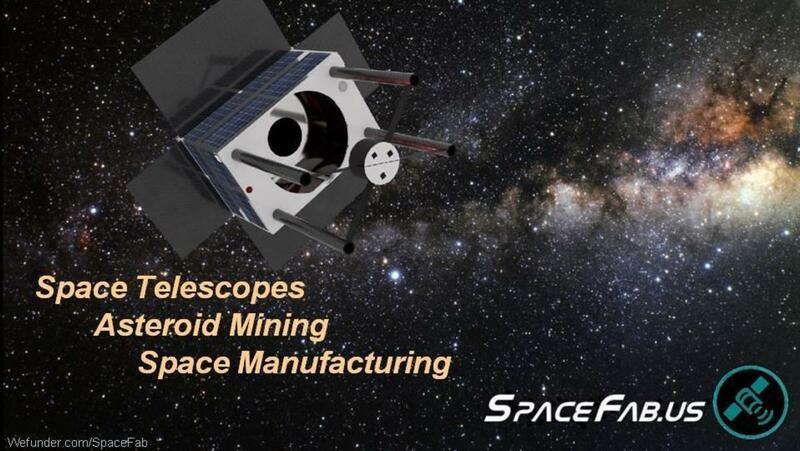 We will leverage our space telescope technologies to extend into asteroid mining and exponential space manufacturing. 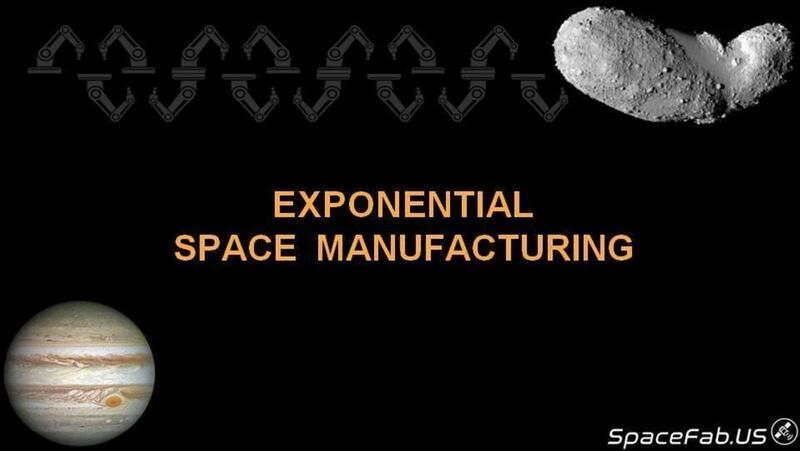 Exponential space manufacturing may make it less expensive to manufacture in space than to manufacture on the Earth, revolutionizing how we build and what we build for space. 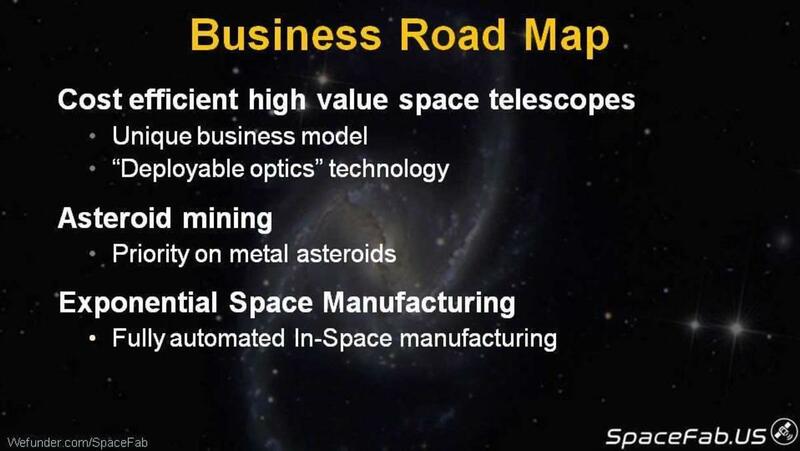 What makes you so excited about space mining, manufacturing, and space telescopes? We are excited about private space enterprise, rather than government programs. The conditions are ripe for private space businesses to be launched and to make a huge impact on the future, similar to the rise of the Internet, the personal computer, and the railroads in the 1800’s. Space has practically unlimited resources, ready to be tapped. 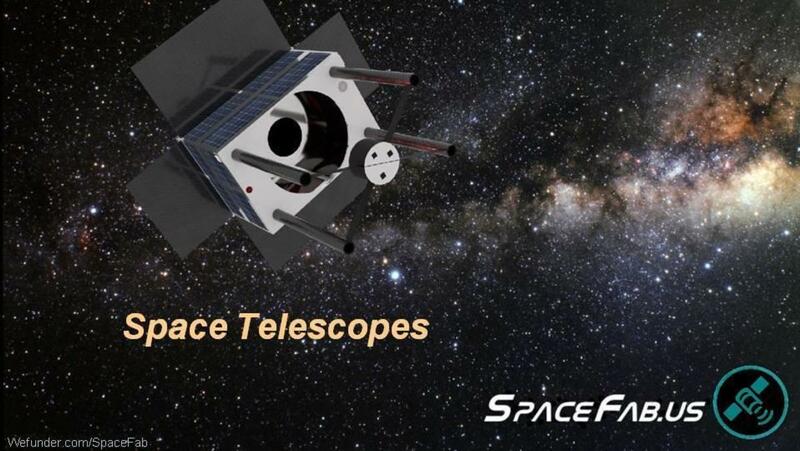 We are currently building space telescopes and will offer our own commercial space telescope observation service. What’s next, in terms of expansion? 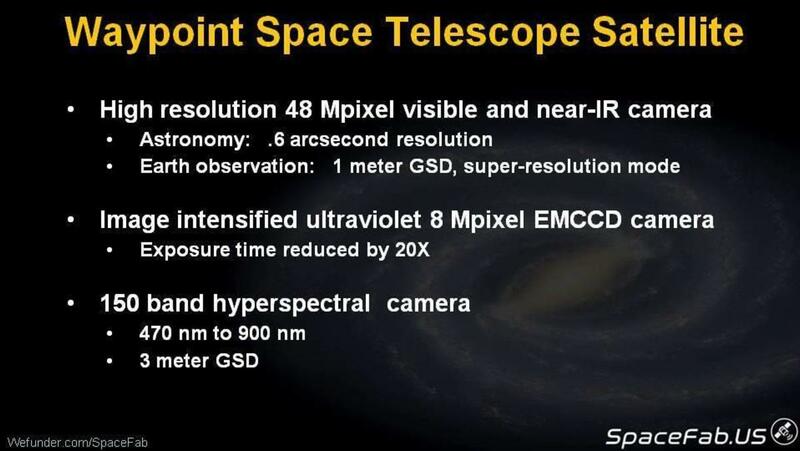 We will be building larger, more sensitive, and higher resolution space telescopes. We will continue to design and build multi-purpose space telescopes that can be used by a wide range of customers in the astronomy, Earth observation, and government markets. In asteroid mining, Planetary Resources and Deep Space Industries are working on mining water from asteroids. 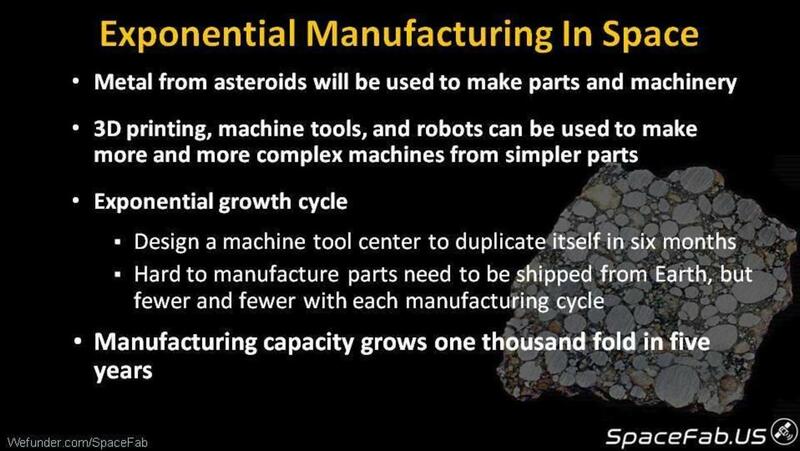 We are focusing on mining metal from asteroids, because that enables exponential manufacturing. 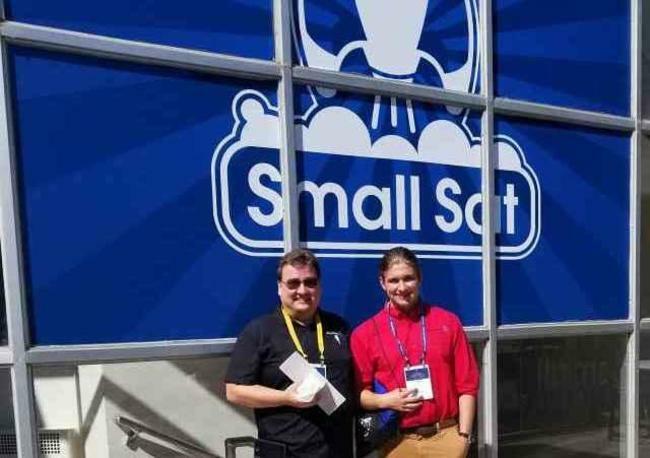 In space manufacturing, Made in Space is working on 3D printing plastic objects in the International Space Station. We are focusing on robotic 3D printing and machining of metal objects and tools in space. In telescope observation services, Slooh.com, iTelescope provide paid ground telescope observation services to amateur astronomers. 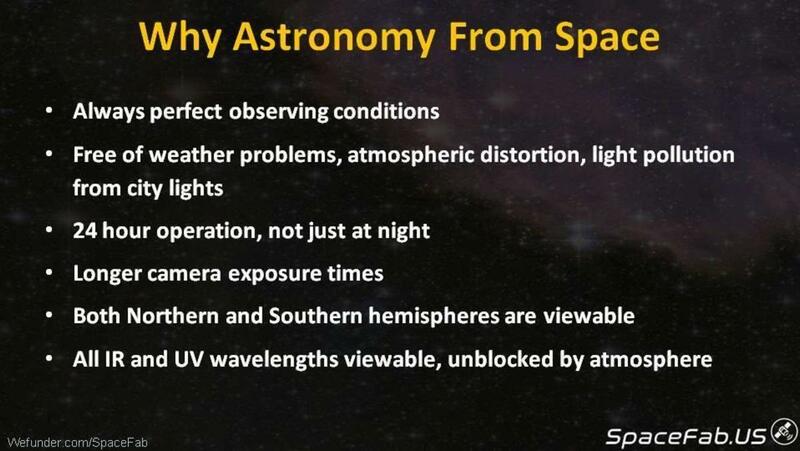 We will provide similar paid observation services using our space telescope satellites. In Earth observation, Digital Globe, Airbus, Planet Labs, and Planetary Resources have or are working on single purpose satellites for Earth observation. 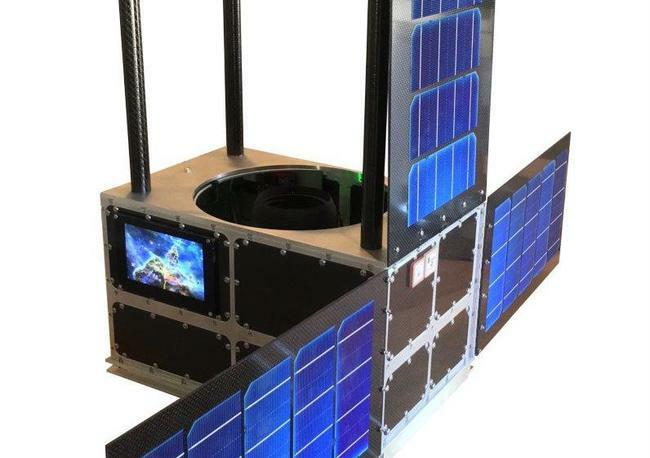 Our SpaceFab satellites will be dual purpose, used for both Earth observation and astronomical observation. Why are we different and better than the competition? For astronomical telescopes, Slooh.com and iTelescope only provide ground based telescope observation. We will be the first service provider dedicated to astronomy with our own commercial space telescope satellites. For asteroid mining, we are concentrating on metal asteroids, while Deep Space Industries and Planetary Resources are concentrating on mining water. The enormous advantage of mining metal is that it enables exponential manufacturing, which will be a transformative multi-billion dollar market. For space manufacturing, Made in Space is concentrating on manufacturing using 3D printed plastic, which must be sent to space from the Earth. 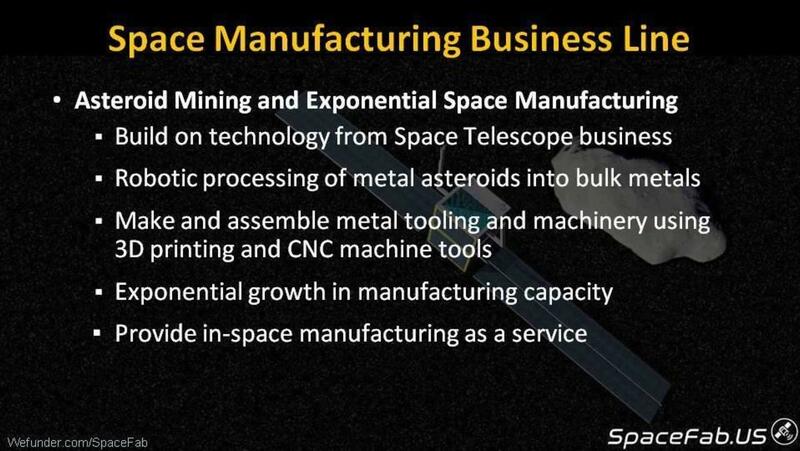 SpaceFab is concentrating on manufacturing using metal that's already in space, and using the metal to build an exponentially growing manufacturing service. In Earth observation, for the same size satellite, our telescope will cost half of much to launch because of our unfolding telescope design. 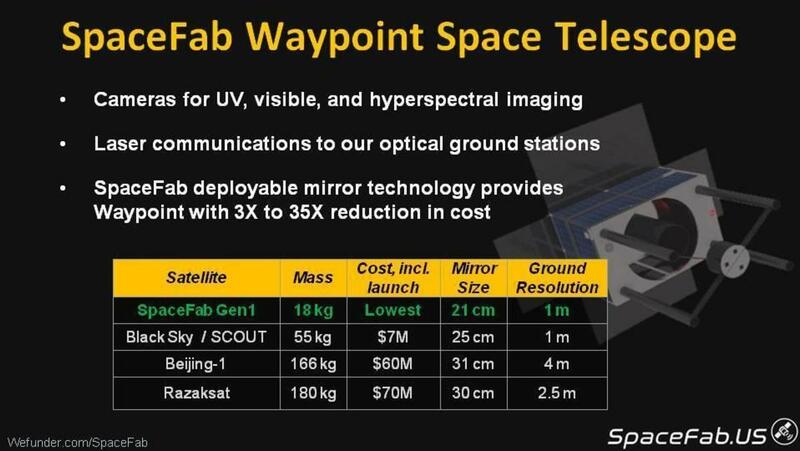 This provides a lower cost, higher sensitivity, and higher resolution telescope than the competitors' satellites. Which segment of the market are you attacking? We are starting out with attacking the astronomical observation market first, because it is not currently being addressed, and because it can be profitably addressed from our very first satellite. We also addressing the Earth observation market with the same space telescope, with high resolution and hyperspectral cameras. 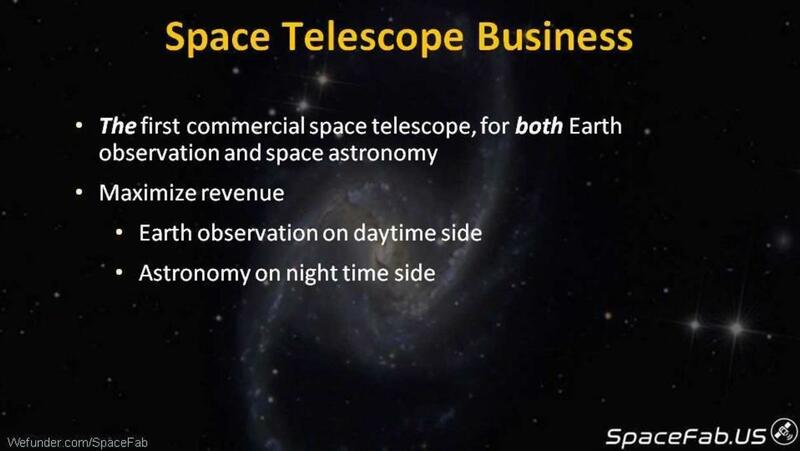 We will address a double sized market, because our space telescope can observe the Earth in the daytime part of the orbit, and perform astronomical observation in the nighttime part of the orbit. What valuations have related companies been acquired for? 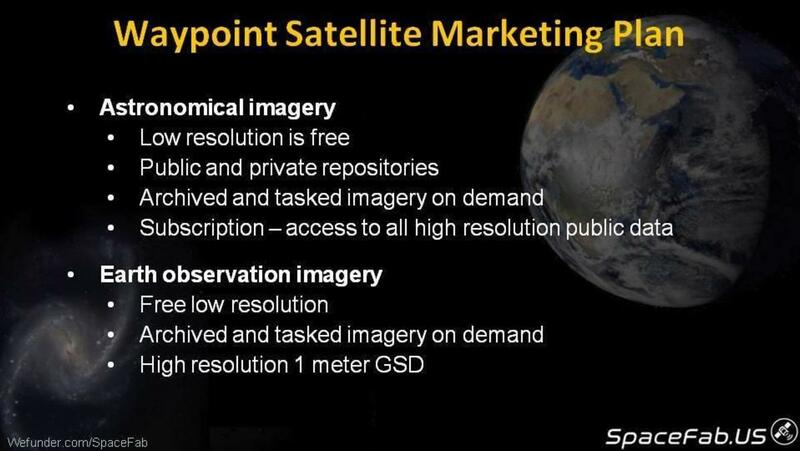 In 2014, Google acquired the five year old company Skybox Imaging for $500 million. How does your technology work? Why is it better? Our unfolding telescope design allows us to build and launch much larger telescopes in a more compact spacecraft. We will have a 2:1 size advantage when launched. 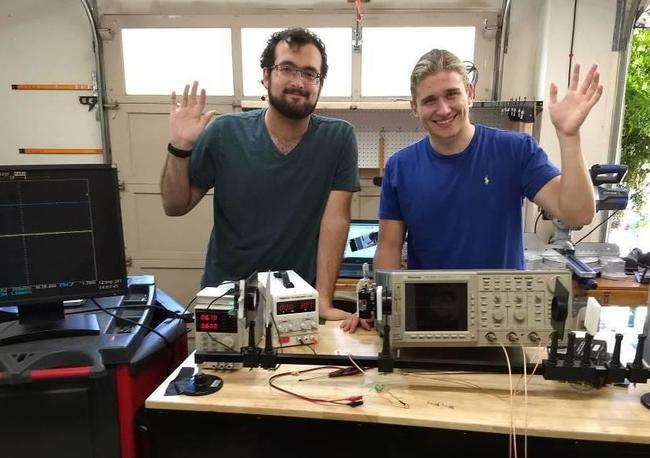 This lowers the launch cost, which can be the major cost for small satellites, and allows us to optimize the optical telescope design.We are also using optical communications to downlink the large amount of telescope image data, and we will use optical communications in the future for our deep space mining and manufacturing. Optical communications provides higher bitrates and longer range at a lower cost than radio communications. Who are your customers and how will you reach them? Our initial market is to provide astronomical observation services to universities, professional astronomers, and amateur astronomers. We will provide services to the tens of thousands of amateur astronomers through our own website, and we will use social media, press coverage, and periodicals to reach the amateur astronomers. 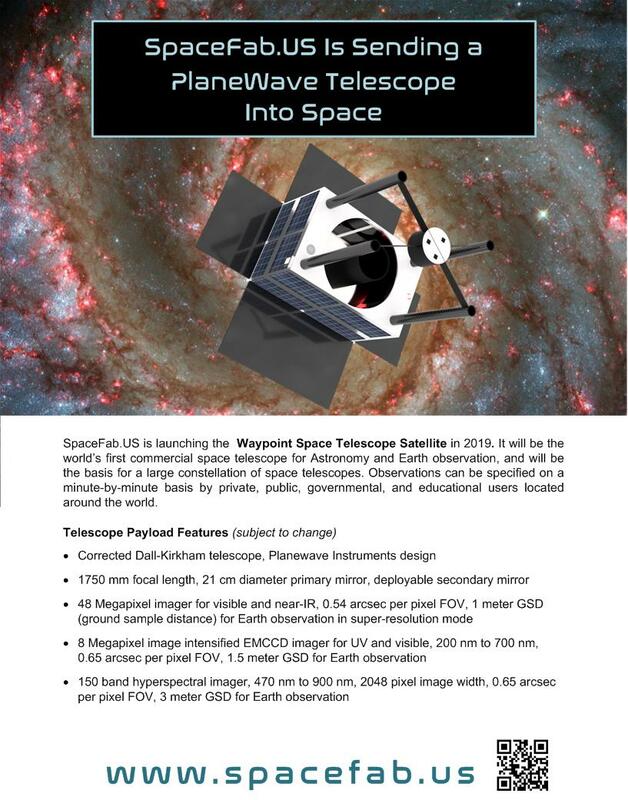 We are already working with a major university on a program funded by the National Science Foundation to provide U.S. colleges access to our space telescope. What are your other financing plans? We will work on raising a Series A financing of $2 million to $3 million at the end of 2017 or early 2018. 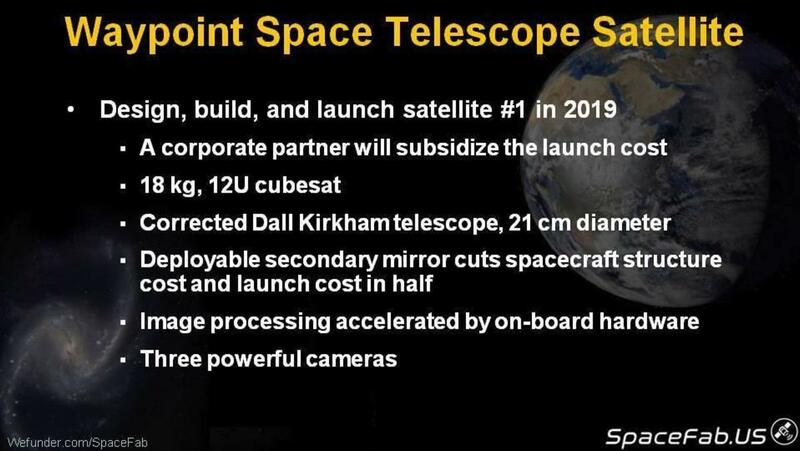 This will allow us to finish our first space telescope, through VC or other type of financing,and launch our satellite in 2019. 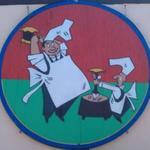 We plan to reach profitability without needing to raise additional funding. Our cash in hand is $843.87, as of April 2018. Over the three months prior, revenues averaged $47/month, cost of goods sold has averaged $0/month, and operational expenses have averaged $1,500/month. 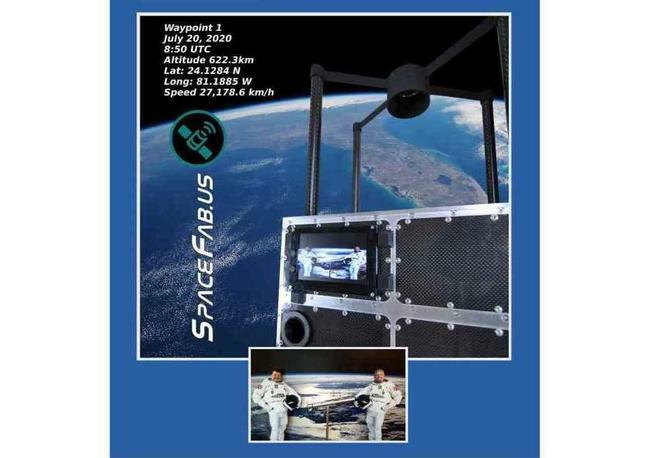 SpaceFab.US, Inc. was incorporated in the State of Delaware in January 2016. 2017 Q1, we have completed the architectural design for an advanced space telescope systemthat will address the astronomy and high-resolution Earth observation markets. 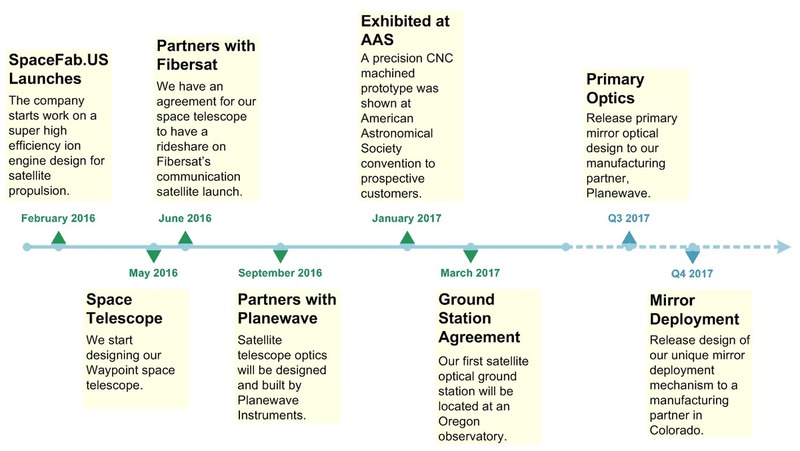 2017 Q3, we released our final optical plan to our telescope optics manufacturing partner. 2017 Q4, we finished the design of our secondary mirror deployer. This deployer design is the key to making our space telescopes smaller and less costly than the competition. 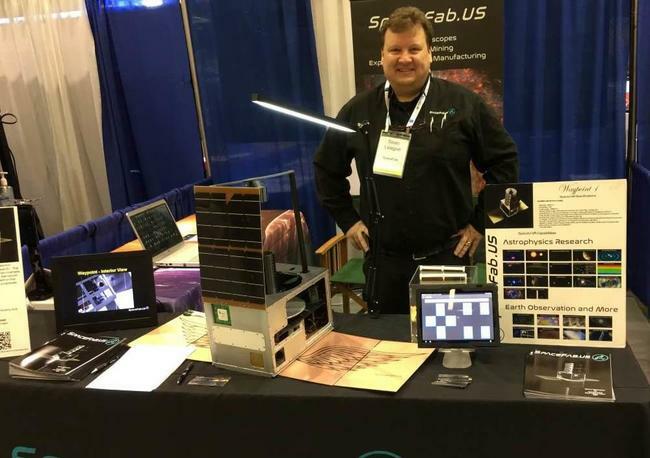 2018 Q1, we exhibited our model satellite at the biggest astronomy conference in the world, promoted our future space telescope services, and received valuable market feedback from researchers at NASA, MIT, and many other institutions. There was great interest in using our space telescope for monitoring exoplanets, supernovae, eclipsing binary stars, and many other objects. Our company was organized in January 2016 and has limited operations upon which prospective investors may base an evaluation of its performance. Revenues & Gross Margin. For the period ended December 31, 2017, the Company had revenues of $0 compared to the year ended December 31, 2016, when the Company had revenues of $0. Our gross margin was % in fiscal year 2017, compared to % in 2016. Assets. As of December 31, 2017, the Company had total assets of $1,328, including $1,328 in cash. As of December 31, 2016, the Company had $3,152 in total assets, including $3,152 in cash. Net Loss. The Company has had net losses of $17,743 and net income of $14,497 for the fiscal years ended December 31, 2017 and December 31, 2016, respectively. Liabilities. The Company's liabilities totaled $15,918 for the fiscal year ended December 31, 2017 and $17,609 for the fiscal year ended December 31, 2016. After the conclusion of this Offering, should we hit our minimum funding target, our projected runway is 12 months before we need to raise further capital. SpaceFab.US, Inc. cash in hand is $843.87, as of April 2018. Over the last three months, revenues have averaged $47/month, cost of goods sold has averaged $0/month, and operational expenses have averaged $1,500/month, for an average burn rate of $1,453 per month. Our intent is to be profitable in 30 months. We have just started selling a limited number space selfie photographs, which will continue for the next several years. The space selfies will be delivered some time after 2020, when our satellite is in orbit. We should have investment of approximately $155,000 by end of April 2017. This will allow us to purchase equipment and hire summer interns. We expect our expenses to increase to an average of 15,000 per month over the next 3 to 6 months. We also expect to sell an additional $15,000 of space selfies over the next 3 to 6 months. Officer will loan funds to corporation when needed in order to continue operations until seed round closes. 1 The shares are speculative investments which involve a substantial risk of loss. We plan to use the funds raised in this Wefunder campaign "seed" round to complete an engineering model of our space telescope satellite. We will need to raise $2 million dollars or more, in addition to the amount raised in this Wefunder campaign "seed" round, to complete the design, manufacture and test our flight model, and then launch our first space telescope satellite. We plan to raise the additional $2 million by showing considerable progress in designing our satellite and demonstrating market interest in use of the satellite. However, we may not make enough progress to convince a venture capital firm to provide "Series A" funding. If this happens, we may have to sell our technology, sell the company, or close the company, and investors might lose their investment. 3 We have a plan to obtain enough revenue to reach break-even within a year after we launch our satellite and it is operational. However, it is possible that there will be a rocket launch failure, and our satellite will be destroyed, which means there will be no revenue. We plan to mitigate this risk by purchasing launch insurance, which should allow us to build and launch a replacement satellite. It is also possible that our satellite will make it into orbit, but then may not function correctly. We plan to mitigate this risk through extensive testing of our satellite, and having employees or consultants experienced in the manufacturing of satellites review our satellite design, testing, and manufacturing procedures. However, if we do not have sufficient funds remaining, or cannot raise additional funds to build and launch a replacement satellite, we may have to sell our technology, sell the company, or close the company, and investors might lose their investment. 4 We have an agreement with a corporate partner who will provide the launch of our satellite when their own satellite launches in mid-2019, and they will also partially subsidize our launch costs. However, the agreement is non-binding and the offer might be withdrawn. If this happens, or if our satellite is not ready when their satellite launches, we will need to raise an additional Five Hundred Thousand Dollars ($500,000) or more, and find an alternate launch provider. This may delay the start of our service, increase our costs, and we will need to raise even more funding, which may not happen. 5 It is also possible that our revenues will be lower than we project, or our costs may be higher than we project, and we may not reach profitability before running out of money. We plan to mitigate the risk of inadequate revenue projections by having customer agreements prior to the raising of "Series A" funds. We plan to mitigate the risk of inadequate cost projections by having consultants experienced in company operations review our business plan. Despite these efforts, if we run out of money and cannot raise more funds, we may have to sell our technology, sell the company, or close the company, and investors might lose their investment. 6 We are not aware of any patent infringement, but someone may accuse us of patent infringement in the future. If that happens, we: (a) will have to pay to defend ourselves; (b) may have to pay for a license; (c) may need to pay for a settlement; or (d) may need to redesign our system, thus increasing our costs. 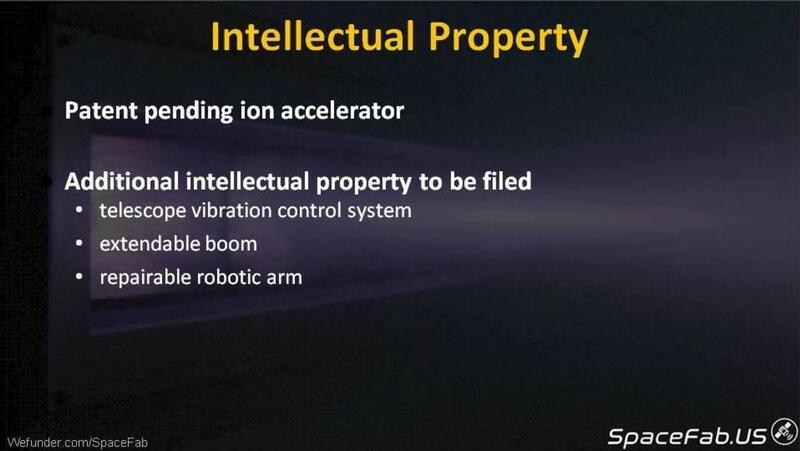 7 Our application for a patent on our ion engine accelerator may be rejected by the U.S. Patent Office, or the technology may not work, or the advantages of the technology may not be as powerful as we expect, so our ion engine technology may not be as valuable as we project. 8 There is no public market for the shares being offered, and no market is expected to develop for the shares in the future. The shares are not being registered under the securities laws of any appropriate jurisdiction, but in reliance on exemptions from such registration requirements. The shares may not be resold or otherwise transferred unless the shares are later registered under the securities laws of any appropriate jurisdiction, or unless an exemption from such registration requirements is available. Accordingly, an investor may be unable to liquidate an investment in the shares and should be prepared to bear the economic risk of an investment in the shares for an indefinite period. In addition, an investor should be able to withstand the total loss of his/her/its investment. 9 It is our plan to launch additional space telescope satellites for use by both astronomical and Earth observation customers. However, it is possible that the astronomical market may not be as large as we project. 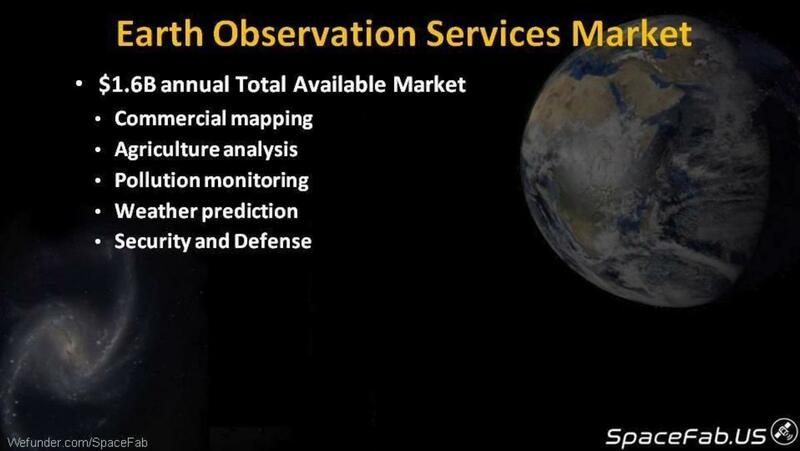 It is also possible that the Earth observation market may be more competitive than we expect, or that our Earth observation technology may be deficient, such as having low resolution, incorrect spectral bands, or long revisit times. If our space telescope business line's revenue does not grow, we may not be able to finance and implement our asteroid mining and space manufacturing businesses, which would limit our long term business prospects. 10 Purchasers will not have an ownership claim to the Company or to any of its assets or revenues for an indefinite amount of time, and depending on when and how the Securities are converted, the Purchasers may never become equity holders of the Company. Purchasers will not become equity holders of the Company unless the Company receives a future round of financing great enough to trigger a conversion and the Company elects to convert the Securities. Purchasers will have no say in whether their securities are converted in any Equity Financing. In certain instances, such as a sale of the Company, an IPO or a dissolution or bankruptcy, the Purchasers may only have a right to receive cash, to the extent available, rather than equity in the Company. Randall Chung, Chief Executive Officer and company co-founder, loaned the company $6500 in 2016, and an additional $3000 in 2017. There is a two year maturity date, and the interest rate for the loans is 3.5%. Mr. Chung has additional unreimbursed expenses of approximately $8,700 in 2016, and $10,200 in 2017. Also Sean League, Director of Spacecraft Engineering and company co-founder, has unreimbursed expenses of approximately $1380 in 2016, and $1930 in 2017. 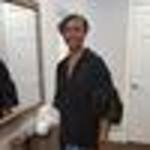 There is no maturity or interest on the unreimbursed expenses. Mr. Chung and Mr. League expect to be reimbursed for expenses and any loans to be repaid upon raising of the seed round of funding. Be creative, take chances, and enjoy life! Semi-retired level one trauma center ER M.D. Going into public health to work on improving health care for minorities. Principal and Structural Engineer at Construction Technologies + Engineering, Inc.
Citizen scientist, interested in all cutting edge space, research, tech, and innovation. Destined and determined to build a bright future. 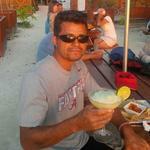 I'm an individual investor and trader who is happily retired and continuing to learn new things. Life is too short, help as many people as you can, starting with yourself to be the best person you can possibly be.!!! 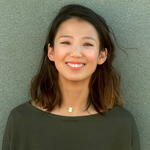 Screenwriter/Photographer: Empowering women in film. Focus on character-driven screenplays; animations; memoir. Grady Hospital Infectious Disease Program as a Dental Hygienist. Direct patient care provider. Believing in a cure since the start of the epidemic. Doctor of Homeopathic Medicine. Safe Alternative to vaccines, educating parents and helping whole families with all levels of health issues. My name is Byron Massey and I look forward to invest in spacefads because space in the future and my investment can help a lot. 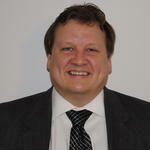 Hi Mr. / Dr. Chung and League, I am Ed and am a embedded software manager at Kostal of America here in the Detroit area. I really like your ideas and look forward to viewing the stars with my son! 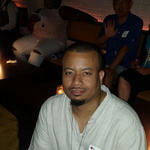 Hi my name is Victor Rosario I own a small graphic design firm business Bluecapsules. 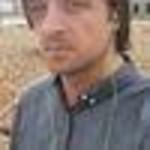 I would be able to help with website development I have over 15 years of experience in the website development field. With an engineering background I can tell you that you guys are going to be successful. Good thing about your venture is you are building it in house as much as possible and that's the reason I invested in it.Keep it up! My name is Rob Bower. I am a friend of Dustin Gibson. 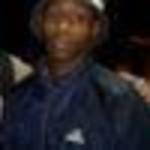 Owner of OPT. I am an ameture astronomer and astro photographer. I am recently disabled so my income is now fixed. But I wanted to offer what little I can to help with this awesome project. Maybe in the future, my financial situation will change, and I will be able to be of more use. For now, I wish you the very best of luck in this new adventure! Amateur astronomer and astrophotographer. Always looking beyond today! Strong supporter of OPT! 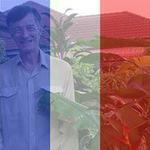 French BA, all the best! 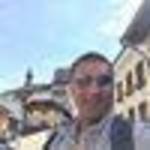 I am an angel investor from China. 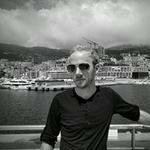 Through Wefunder platform,I have invested over 15 startups. 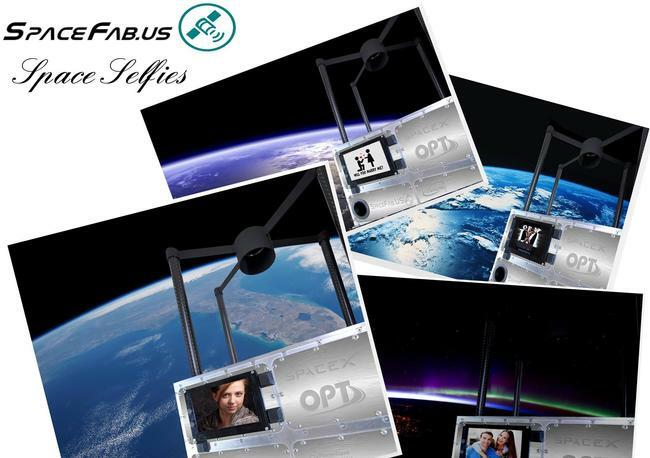 My name is Pasquale and thrilled to have invested in SpaceFab. 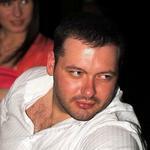 An amateur astronomer for many years with a BS in Environmental Biology and MS in Computer Science. Currently a naturalist for an aquarium. I would like to contribute my talents to SpaceFab. Thanks! Hi, this is a great idea. I am very happy to be a part of it. 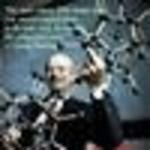 I'm a biochemist, working in the biotech industry. 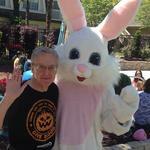 I've been an amateur astronomer for 50 years. I am a structural engineer and amateur telescope maker (ATM) - www.cteg.com Ready to design space structures. Hi, I’m Ken Hobbs. I’ve done business with Sean via OPT. I think this is a great idea and am pleased to help. 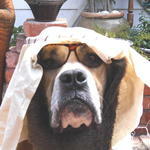 I am retired and did camera recon in Air Force and TV repair 2 decades ago. 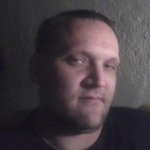 My name is Byron Massey and look forward to invest in in your company and I like the furture of space and new thing come out of the space program the make things better for the world I can help by telling people about your company and how it can help people in daily life I love you hear how your company do each year. 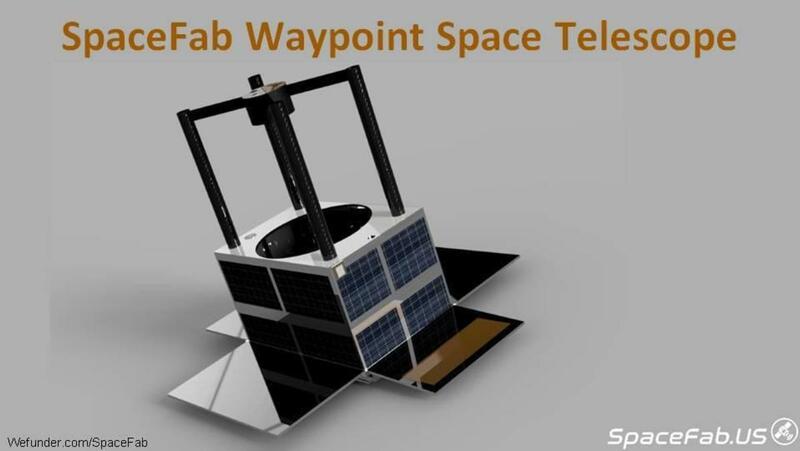 Spacefab is currently building ther Waypoint space telescope with a 21 centimeter mirror. It is launching as a co-payload on a SpaceX rocket in 2019. This commercial telescope will have an image intensified ultraviolet and visible camera, and a 48 megapixel camera for visible and near-infrared imaging for astronomical and Earth observation purposes, available for use by customers around the world. 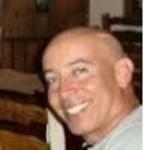 Guest: Dr. David Livingston; Topics: This was supposed to be a program for those who self-invite themselves as a guest on The Space Show. No such callers called. We talked space telescopes re SpaceFab. Please direct all comments and questions regarding specific Space Show programs & guest(s) to the Space Show blog which is part of archived program on our website, www.thespaceshow.com. Centauri Dreams returns with an essay by long-time contributor Alex Tolley. If we need to grow a much bigger economy to make starships possible one day, the best way to proceed should be through building an infrastructure starting in the inner Solar System and working outward. ORANGE COUNTY, California (SpaceFab PR) - SpaceFab.US is a new space startup company working on space telescope satellites, asteroid mining, and space manufacturing. 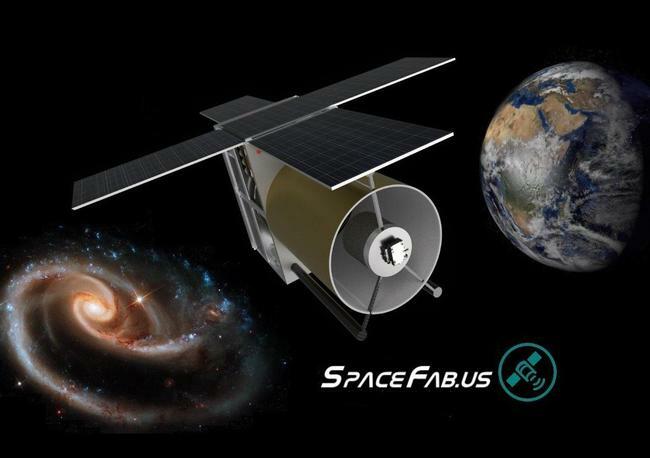 The company, also known as SpaceFab, is designing and building its first space telescope, scheduled for launch in late 2019. 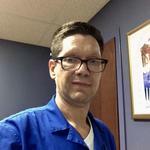 Listen to Randy talk about SpaceFab from 21min to 46 min. 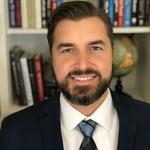 Guest: Open Lines with Dr. David Livingston; Topics: We discussed a variety of space and related topics ranging from equity crowd funding, commercial space telescopes, Moonwards, lunar landers and more. Please direct all comments and questions regarding specific Space Show programs &amp; guest(s) to the Space Show blog which is part of archived program on our website, www.thespaceshow.com. The Big Picture Science radio show and podcast engages the public with modern science research through lively and intelligent storytelling. Hear about SpaceFab at 19:10 minutes in. Thanks for vouching for Randall! If you'd like to invest in Randall, please open an account. We'll waive your fees if you do it now. We asked Randall for 10 personal references. Can you vouch for Randall?